The holiday lights have come down. The carolers have gone home. The official “season of giving,” of volunteering and donating to our favorite causes at a rapid clip, is over. One group often cared for during the holidays is those experiencing homelessness. Through serving meals and giving gifts, society at large is more mindful of those without the most basic need of all – somewhere safe to lay one’s head at night. Against external threats to their safety. So we work. And we walk. And we write. The idea of permanent supportive housing for homeless individuals is simple: it reminds us that what a homeless person really needs is…a home! 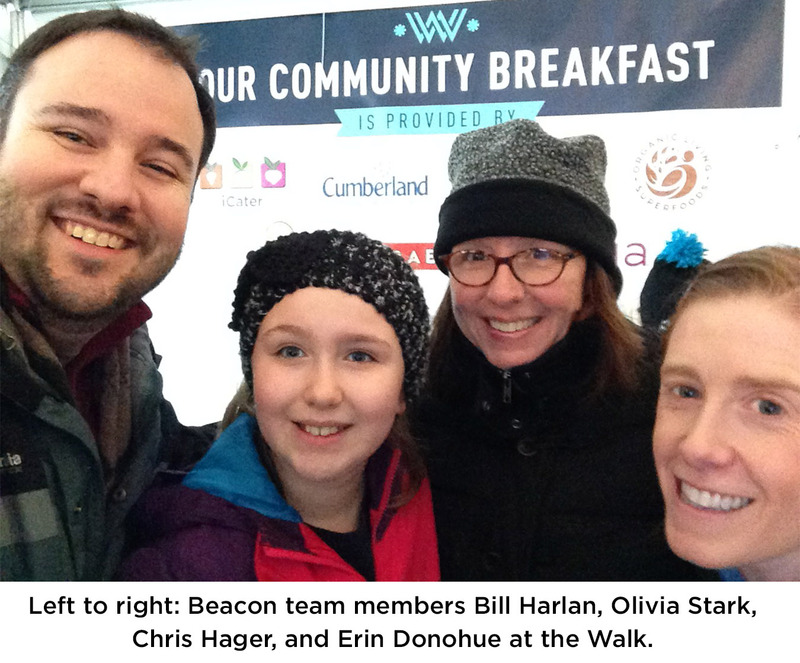 In February, at the height of the “winter doldrums,” a Beacon Health Options team took to Boston’s streets for the inaugural Winter Walk to raise funds and awareness around ending homelessness in Boston. But what does ending homelessness mean? How can we – as Beacon employees, clients, and partners – be involved in ending (not just managing) homelessness? The good news is that research shows that permanent supportive housing for chronically homeless individuals is successful in ending homelessness and reducing overall health care expenditures,,  The idea of permanent supportive housing for homeless individuals is simple: it reminds us that what a homeless person really needs is…a home! But not just any home – a home with supportive services that will help a person meet his/her demons head-on and surmount those normally insurmountable bureaucracies with a case manager’s help. A home where that case manager knocks on the door each day and says “How’s it going today?” And most importantly, a home that provides the stable foundation necessary for individuals to rebuild their lives. In short, a home in which to heal. There was an average decrease of $226 per person in Massachusetts Medicaid (MassHealth) costs in the month immediately following the start of CSPECH services. This decline continued so that by one’s 24th month in CSPECH, monthly costs were $765 lower than in the month prior to CSPECH entry. Among the 1,301 individuals in CSPECH who were part of this study, significant reductions in behavioral health and medical costs led to an overall reduction in MassHealth costs of $11,914 annually per person. For this same group, annual per person net savings were $7,013. Each dollar spent on CSPECH yielded a return on investment of $2.43, due to the reductions in non-CSPECH MassHealth costs that more than offset the cost of CSPECH services. The numbers don’t tell the whole story. The stories of those who have benefitted from CSPECH do. CSPECH wouldn’t be possible without the strong partnerships Beacon has created with housing and homeless service providers. We provide the resources to cover supportive services; they deliver the services in the context of the permanent housing that they bring to the table. It is a rich example that we are more powerful together than apart. So, after the lights have dimmed, the storefronts stripped of their finery, and the season of giving has officially concluded, I invite you to learn more about and become involved in this strategy that helps to end homelessness and improve health – all year round.